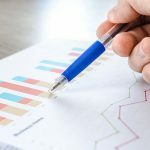 With extraction you can make sure that subsequent questions only show certain options that your respondents have marked in a previous question. This way respondents will only see the answer options that matter to them. How can I apply extraction? First create your source question (the question you are going to base yourself on) and your target question (the question that will only show the options marked in the source question). Make sure both questions are on separate pages. Also make sure that the answer options are in exactly the same order. These answer options do not need to have the same wording, though. Click on the icon next to the target question and click Edit. Here you will see the option Extraction based on. 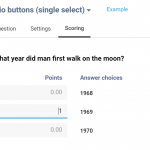 Select the correct source question in the drop-down menu and click on Save. Attention! 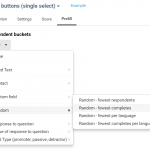 Extraction is possible as of the second page of your survey as you cannot select previous questions yet on the first page. Below you can find an example of what extraction looks like for your respondents. We also have a short extraction demo available on our website. 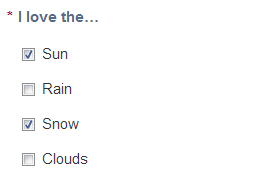 This is the source question in which your respondents indicate what kind of weather they like. It is also possible to apply extraction to a question that is asked a few questions later. The source and target question do not necessarily need to be subsequent questions. As long as the questions are on separate pages and the options are in the same order, extraction is possible. What is page display logic? I am building a survey for the organization I work in. My source question has the option of “Other, please specify” and I would like to carry the answer through to the target question. Right now when I put “Other, please specify” as one of the options in the target question (where I hoped that the answer from the source question would be carried over), I just get the option as is with an open text box again, and the answer from the source question is lost. Is there a way to carry the response over? You’ll need to put a variable $$$Questx-y$$$ instead of activating the ‘other please specify’ again. Replace the ‘x’ by the source question number and the ‘y’ by the place of the response that you want to show. So, for example, if your source question is question 5 and the ‘other please specify’ is the 6th possible response, put $$$Quest5-6$$$ in the target question. Don’t tick ‘other please specify’ in your follow-up question. You don’t need it in this particular case. When you do that, the answer provided in the ‘other’ box will be shown in the follow-up question. This method is also explained in the following article: Use piping to show given answers in a follow-up question. How do I use only the answers from a response list not selected to appear at a follow-on question (first mention/all other mentions)? That is also possible, with some help from our programmers. I see you’ve also opened a ticket with our support team concerning this specific use-case. We’ll get back to you via that ticket. It is unclear to me how I could use Extraction to use the answers to a list of textboxes as sub-questions in a Matrix checkbox. When editing the Matrix checkbox I am able to select the right question to extract from, but when I hit ‘save’, a message warns me that I need to fill in a minimum of 1 sub-question. How can I avoid this? In that case you need to combine extraction with piping. You simply put the correct piping variables as the sub-questions in the matrix. This set-up, combined with extraction, makes sure that only the options that were actually filled out in the list of text boxes will come back – literally – in the matrix.